Please read the IRB Policy and Procedure Manual prior to submitting your application. The application must be downloaded and saved to your computer, then submitted via e-mail. ADDITIONALLY, a hard copy must also be submitted to the address below. Can't open the PDF? Download the most recent version of Adobe Reader here. One electronic copy of the application via email to the IRB Chair. One hard copy of the application with any documented protocol (such as the questionnaires or assessment instruments that you propose to use). For more information about the application process, please contact Dr. Paul Stonehouse at (530) 226-4970. Be sure to download/save the application file(s) to your computer before editing, saving and emailing to irb@simpsonu.edu. When you open the form(s) in Reader, you'll need to click on "Sign" in the top right of Adobe Reader, then you can Add Text and your signature (Place Signature) where applicable, re-save the file, then attach to your email and send. 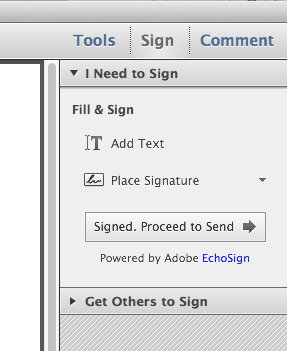 Do NOT send/submit the form/file via Adobe Reader (or Adobe EchoSign). You must SUBMIT the forms as an attachment in a regular email.